The Guyana Volleyball Federation (GVF)\Federation Internationale de Volleyball (FIVB) one week beach volleyball grassroots course concluded yesterday at the Carifesta Sports Complex. 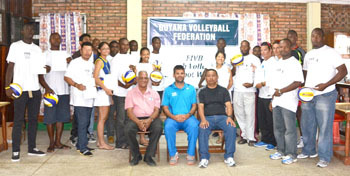 President of the GVF, Lenny Shuffler said that the course is a part of the FIVB beach volleyball programme and thanked FIVB instructor Mauro Hernandez, the Ministry of Culture Youth and Sport, Beharry Group and John Fernandes for their contribution. Participants (standing) display their certificates. Sitting form left is President of the GVF, Lenny Shuffler, Mauro Hernandez and John Flores. commitment and co-operation. “I hope that the participants can take back the knowledge to their various organisations. There are lots of beaches in Guyana and if the ministry of tourism can develop the beaches especially the one at Number 63, we can compete against Suriname at a low cost. One of the areas we will look at is region 09 and this can link us with Brazil. We are on the right track and we will be looking at a beach volleyball tournament shortly; Venezuela and Brazil are ready to help”, added Shuffler. FIVB instructor Mauro Hernandez, through an interpreter said that he reached his expectations during the course and hoped the participants will achieve their goals. He stated that the course is very important to start beach volleyball in Guyana and noted drastic changes during the clinic. Hernandez informed that he is impressed with the quality of some of the individuals and said he is happy to assist with the development of the game in Guyana. He pointed out that it is important what each participant will do with our knowledge and where they will apply it. Hernandez indicated that Guyana is an excellent place to play beach volleyball and hope there will be support for the game locally. He stated that he is looking forward to see a tournament involving Guyana, Brazil and Venezuela. Hernandez also said that he wants to see Guyana being represented at the Olympics. The participants were presented with certificates while Hernandez was given a token of appreciation; the Berbice Volleyball Association and the Demerara Volleyball Federation were presented with 6 balls and 2 nets each.